Those who love Ferrari (specifically the 458) and the ice-drifting at the same time, then these spy-shots are for them. 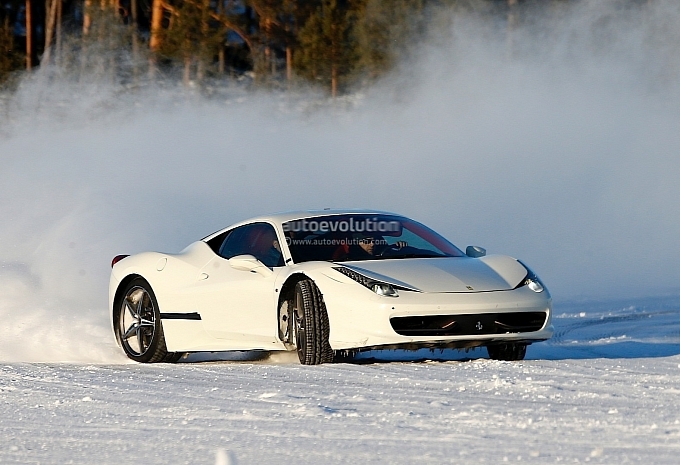 The Ferrari 458 replacement which was reported to be in the development is now spotted doing test rounds on the ice. Well, not exactly the test rounds, but to be said as the exciting rounds of ice-drifting, somewhere in Northern Sweden. The white paint job and that nearly same shade ice are bringing in more life to these spy photographs. Hopefully, the Italian supercar seems to be in its early stage of development so no connection to be made as specific about its technicalities. But the Ferrari will be incomplete without a turbocharged V8! New Ferrari 458 is expected to hit the gates of market by 2015.